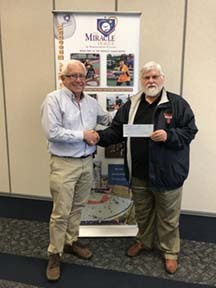 For the past several years Calpine Corporation has been a very supportive friend of the Miracle League of Northampton County. At the Board of Directors meeting of May 22, 2017 Calpine’s Tom Seifert presented a check to President Bob Lammi. Lammi thanked Mr. Seifert on behalf of the Board and the our players.